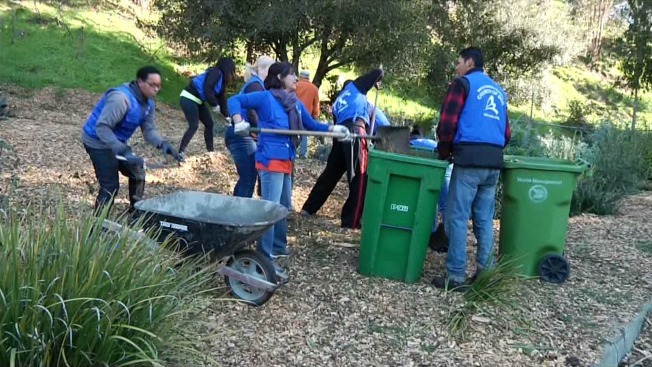 A host of volunteers on Sunday rolled up their sleeves and ripped away pesky shrubbery from a section of the Oakland Hills as part of a fire prevention effort. The high school-aged and older volunteers representing the World Mission Society Church of God from Hayward teamed up with the Oakland Landscape Committee to gut the area of overgrown weeds and spread mulch to reduce the risk of a dangerous wildfires. Twenty-five people were killed by the devastating 1991 Oakland Hills Fire, one of the worst urban blazes in the nation's history. A total of 2,843 single-family dwellings as well as 437 apartment or condominium units were destroyed by the fire.